From Tamashii Nations. 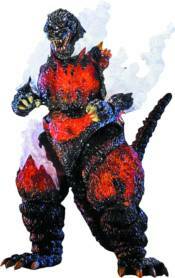 Fans of the Heisei-era Godzilla works will recognize this fiery rendition of everyone's favorite radioactive kaiju as he appeared in the unforgettable film Godzilla vs. Destoroyah. Clear parts are used throughout the body and tail to recreate Godzilla's melt-down. The unforgettable smoke that emitted from Godzilla's body is also masterfully recreated with 4 special option parts that can be displayed or removed.